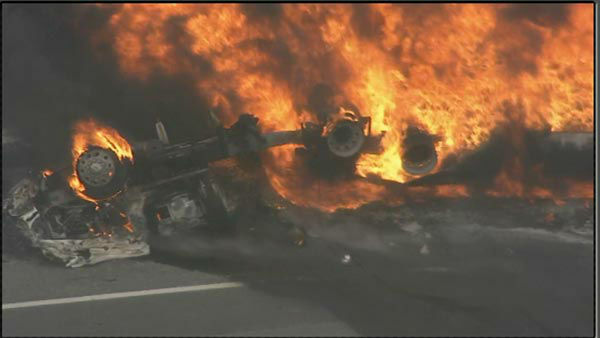 An overturned tanker truck burst into flames near the Betsy Ross Bridge Monday morning in Pennsauken, New Jersey. PENNSAUKEN, NJ -- A tanker truck carrying 9,000 gallons of fuel overturned and burst into flames near the Betsy Ross Bridge Monday morning in Pennsauken, New Jersey. The accident happened around 11:00 a.m. on the northbound ramp from Route 90 to Route 130. Chopper 6 was over the scene where two fires could be seen - one approximately 100 yards behind the burning remains of the truck. Authorities say the driver - who apparently was alone in the truck - was able to get out of the vehicle. But it wasn't immediately clear if the driver suffered any injuries. Firefighters are dousing the blaze with foam from across the highway. Nearby homes are being evacuated as a precaution, and traffic is being diverted from the area. Information from The Associated Press was used in the writing of this post.